It’s a story of heartbreak, anguish, and finally joy: a couple in Texas has posted a picture on Facebook that truly is worth a thousand words, and gives hope to those that have struggled to become president. 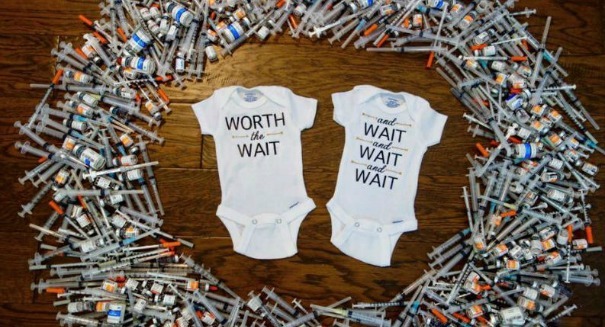 Lauren and Garyt Walker posted a picture of onesies with the words “worth the wait” surrounded by hundreds of used in vitro fertilization needles. The image quickly went viral on social media. The picture told the story of a couple that had spent 953 days and 452 IVF injections trying to get a child, and finally being rewarded with not just one baby, but two. Duke and Diana will be born this August if all goes according to plan. Lauren wrote her story on her Facebook page in detail. She says she’s hopeful that their story will inspire many others trying for a baby to keep up the fight, and eventually it will pay off.